Situated in Symonds Yat East, Rose Cottage has been a popular destination for visitors for centuries partly due to the ancient hand pulled ferry which operates outside our front door and partly for the multitude of activities available locally on and off the river. 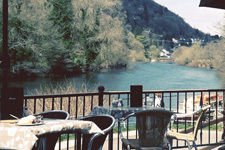 The view from Rose Cottage upstream looks over to Symonds Yat West towards the Olde Ferrie Inn whilst downstream you can see The Biblins Rapids and the glorious Three Counties View of Herefordshire, Gloucestershire and Monmouthshire. No matter what season you decide to visit you will find something for everyone. Whether you are looking for outdoor activities or simply a few days escape from the rat race you will find Symonds Yat East an idyllic corner of Old England and always a very warm welcome for you at Rose Cottage.